The pattern is Gallia, and these have the pattern on the base. The nice Rogaska crystal lowball glass in Gallia pattern in very good condition stands 4" tall and 3 1/2" wide at the top. Gallia 4" Trumpet Vase. Rogaska Lead Crystal. 2 1/2" across top. The nice Rogaska crystal tumbler / highball glasses in Gallia pattern in very good condition stands 5 3/8" tall and 3" wide at the top. 11" Tall X 4 1/2" Wide. Champagne Tall Sherbet Glass Goblet Rogaska Crystal Gallia Pattern 5 3/4"
Pieces are sold individually, so a quantity of one represents one glass. Very Good Condition (Features signs of previous use, chip on inner base of stopper). Rogaska Crystal - "GALLIA" - Wine Hock Glasses, Set of four. 8" tall. Rogaska Crystal - "GALLIA" - Wine Hock Glasses - 8" Tall. - Set of four. THE QUALITY AND DETAIL ARE EXQUISITE! YOU WILL LOVE THIS BOWL! YOU WILL NOT BE DISAPPOINTED WITH THIS EXCELLENT CONDITION BOWL. THE ONLY THING I CAN FIND UPON CLOSE INSPECTION ARE A FEW MINUSCULE SCRATCHES ON THE UNDERSIDE OF THE BASE. CLICK ON FULL DESCRIPTION AND SEE ALL DETAILS AND PICTURE Please view all pictures and ask question, I to not take returns on shoes. This is a lightly handled piece, with original labels affixed on top and bottom sides of base. We're happy to respond based on what we know and can observe. 1 3/4" tall and 5" wide. ROGASKA CRYSTAL GALLIA 11" DECANTER WITH STOPPER - MINTY!! Beautiful Rogaska Gallia crystal Decanter with faceted stopper. Minty!!. The gold is bright and unworn. This is a beautiful Rogaska Lead Crystal Vase. The cuts are deep near the bottom and very delicate near the top edge. There is one small scratch near the top edge. It is signed and has the pattern sticker on the vase. Up for sale is a 13 1/2" tall Rogaska Gallia decanter. It is in excellent, chip and crack free condition. Hand Wash fine porcelain/china and glass and do not place in the dishwasher or microwave. ROGASKA GALLIA CUT CRYSTAL FLORAL ASHTRAY 5 7/8'' EUC. Rogaska Crystal - "GALLIA - Fluted Champagne Glasses - Set of four. 8 1/4" tall. - Set of four. It has a 5/8" THICK base! Chain of Flowers with etched AND CUT leaves alternate around the decanter as well! ZIPPER CUT neck and 16 point star cut base. VERY CLEAR GLASS! They each hold 8 ounces. Rogaska Crystal - "Gallia" - Wine Glasses Set of four. 7 3/4" tall. 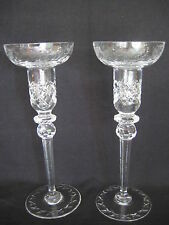 Rogaska Crystal - "GALLIA" - Wine Glasses - 7 3/4" Tall. - Set of four. 7 1/2" Tall X 2 1/2" Wide. BEAUTIFUL ROGASKA LEAD CRYSTAL ASHTRAY. THE BEAUTIFUL FLORAL DESIGN CIRCLES THE ASHTRAY. OVERALL IN EXCELLENT CONDITION! The gold is bright and free of wear. Very good Condition (It may have slight used signs). Approximately 7 1/8" tall and 4 3/4" across the top. Stunning champagne sherbets (aka coupe champagne) in the Gallia pattern by Rogaska. Signed. This is a Gallia pattern 5 1/4" tall champagne goblet or sherbet produced by the Rogaska crystal factory in Slovenia. This pattern has been retired from production by the factory. ROGASKA CRYSTAL "GALLIA " WATER GOBLET. FROM A HIGH END ESTATE. (1) ROGASKA CRYSTAL GALLIA BRANDY SNIFTER 4 1/4"
A gorgeous pattern that was produced from 1969 - 2015. to the rim. Looks new. 1 - 8 1/4" Champagne Flute. Included: 1 - 7 3/4" Wine Glass. 1 - 7 1/8" Tall Coupe Champagne/Sherbert. Approximately 7 1/8" tall and 4 7/8" across the top. Stunning champagne sherbets (aka coupe champagne) in the Gallia pattern from Birks, unsigned. Fine cut crystal with frosted floral etch design. Not marked. NEAR MINT condition! No stopper. A beautiful piece that will make a fine addition to any collection!